In previous articles, we discussed mechanisms that would make the process of trading algorithm creation efficient and simple — in particular, we have created the CStartegy algorithm. The project is constantly evolving for more than six months. During this time, new modules have been added to CStrategy to make the trading process more efficient and secure in terms of technical execution of trading operations. However, the engine still lacked one important feature. Despite the fact that CStrategy is a strictly object-oriented application, it still remained a "thing in itself". The object-oriented approach postulates openness and modularity of the code. In fact, the code base should be based on common general classes. Especially it concerns the trading model and the signal formation model. The CStrategy trading logic is well based on the standard CTrade trading module, but things are not so good with the database of signals in CStrategy. Simply put, CStrategy did not contain any module responsible for generating trading signals. With the previous versions, any user had to re-write the Expert Advisor logic from scratch, even if the required signal were available in the standard MetaTrader 5 package. Therefore, it was decided to add to the new version of CStrategy mechanisms for working with the database of standard MetaTrader 5 signals. In this article, I will explain how to integrate CStrategy with one of the standard signal modules, and will show you how to create your own strategy using exclusively the ready-made algorithms. A set of various classes included into the standard MetaTrader 5 package are used for generating automated strategies using the MQL Wizard. The classes are available as mqh files located in the appropriate subfolders of the MQL5\Include directory. These classes (or modules) can be conventionally divided into several categories. Here they are. Basic classes for organizing data (CObject, CArrayDouble, CArrayObj and others). All other modules for trading are constructed based on these classes. Classes for accessing indicator buffers (CDoubleBuffer, CIndicatorBuffer). Accordingly, they are used for working with indicators. Indicator classes and timeseries classes based on the common CSeries class. 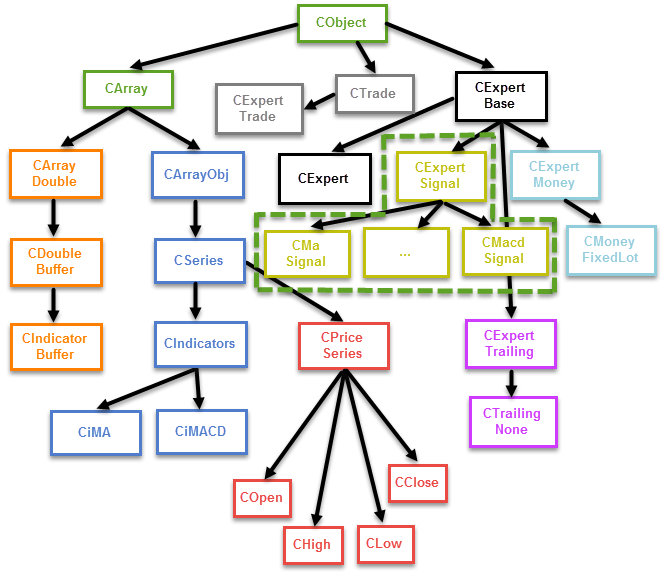 The basic expert class CBaseExpert and CExpert derived from it. All auxiliary modules are based on CBaseExpert — for example, the module for calculating capital and trailing stop control module. CExpert is the basis of all custom Expert Advisors. Signal modules based on CExpertSignal, which in turn is based on CEpertBase. The modules of signals generate trading Buy and Sell signals. They use the classes of indicators, on which the signals are based. The CExpertTrade trading module. It is based on the CTrade class, and it provides access to the execution of trade operations. The figure only shows basic and some derived classes. The scheme does not feature all indicators inherited from CIndicators. Separate trailing, money management and signal modules are not included into the scheme. Instead, only the basic relationships are outlined. One of the featured groups is of interest to us: the signal classes CExpertSignal and its child classes. In Figure 1, the group is highlighted by a green dotted line. In addition to vertical links, classes form a complex system of inclusion (horizontal links). For example, signal modules actively use indicator classes which, in turn, use indicator buffers. Various sets are part of each other. For example, money management modules are at the same time trading experts (at least at the level of CExpertBase), although it is not obvious whether these modules have anything to do with the Expert Advisor. As a rule, complex initialization chains are required in order to create the objects of these classes. For example, in order to create a signal object, such as CSignalMacd, we should initialize the signal, initialize appropriate indicators on which it is based, as well as initialize required timeseries (child classes of CPriceSeries) required for signal operation. Since the object can be initialized by complex objects, they also require initialization (like timeseries). Thus, the question of initialization is one of the most complicated parts of the described library. It should be noted that the initialization problems are not relevant for the users of the automated strategy generator. The entire chain of initializations is created automatically in the strategy generator, all the user needs to do is to start using the Expert Advisor. The situation is different for those who are going to use this set of classes to create their own solutions. In this case, it will be necessary to perform the entire initialization chain. The detailed description of the patterns is available in the terminal Help files, so we will not discuss the details here. Other signal modules contain different patterns, and the different numbers of them. 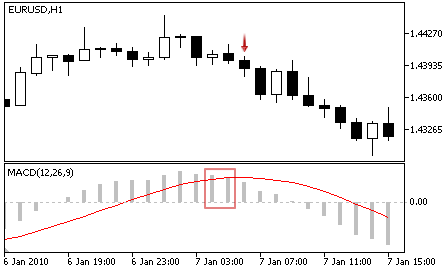 Typically, every signal contains an average of three buying patterns and three selling ones. A signal can contain a maximum of 32 patterns in one direction and 32 in the opposite one (this is the length of a bit field of the integer variable that stores the mask of used patterns). In this case the CSignalMacd signal module will only return a value when a Divergence is formed, i.e. the pattern of the MACD indicator, in which the first analyzed valley of the oscillator is shallower than the previous one, and the corresponding price valley is deeper than the previous one (the is a definition for buying). All other patterns will be skipped. If the pattern is used and the corresponding conditions are fulfilled, the recommendation result will be equal to the corresponding pattern weight, which, in turn, is defined by the user through the Pattern_x group methods. However, if you use multiple patterns, it is not possible to find out which of them has triggered, because the check does not have interrupt operators. The strength of recommendations in this case will be equal to the weight of the pattern that was determined last. The number of the pattern that you want to use should be given in a special bit mask. For example, if you want to use pattern No 3, the fourth bit of the 32-bit variable should be equal to 1 (note that indexing of patterns starts with zero, so the fourth digit is used for the third pattern, while the first digit is used for the zero pattern). If we convert the number 1000 in binary to a decimal, we get the number 8. That is the number you need to pass to the PatternsUsage method. Patterns can be combined. For example, in order to use the pattern No 3 together with the pattern No 2, you must create a bit field, the fourth and the third digits of which would be equal to one: 1100. The same value in the decimal format is 12. We now have learned enough to start using the modules of signals. Let us experiment on the basis of CStrategy. For this purpose, we create a special experimental class, the CSignalSamples strategy. #property copyright "Copyright 2016, Vasiliy Sokolov." The latest versions of CStrategy contain a new event OnEvent, which is represented by the OnEvent method, which is called whenever an event occurs. Unlike the more familiar methods BuyInit, SellInit, BuySupport and SellSupport, OnEvent is called regardless of the trading strategy mode and the trading schedule. Thus, OnEvent allows accessing the stream of events from the strategy, while maintaining a strict event model. OnEvent is very convenient to use for common calculations or actions, which are not related to a specific buy or sell direction. This notification indicates that the requested signals have been successfully received, and we can continue to integrate the signal module into our strategy. Buying: "Crossover of the main and signal line" — the main line is above the signal line at the analyzed bar and below the signal line at the previous one. Selling: "Crossover of the main and signal line" — the main line is below the signal line at the analyzed bar and above the signal line at the previous one. int               m_period_fast;    // Oscillator parameter "fast EMA period"
int               m_period_slow;    // Oscillator parameter "slow EMA period"
int               m_period_signal;  // Oscillator parameter "difference averaging period"
ENUM_APPLIED_PRICE m_applied;       // Oscillator parameter "price series"
int               m_pattern_0;      // pattern 0 "oscillator moves in the required direction"
int               m_pattern_1;      // pattern 1 "oscillator reverses towards the required direction"
int               m_pattern_2;      // pattern 2 "crossover of the main and signal line"
int               m_pattern_3;      // pattern 3 "crossover of the main line and the zero level"
int               m_pattern_4;      // pattern 4 "divergence of the oscillator and the price"
int               m_pattern_5;      // pattern 5 "double divergence of the oscillator and price"
From the comments in the code we can see that the pattern type is of No 2. 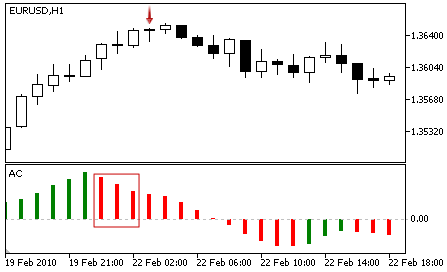 Long and short positions are opened based on the signals described in the reference. Existing positions are closed by opposite signals. Thus, if there is a condition to open a long position, the previously opened short position will be closed, and vice versa. 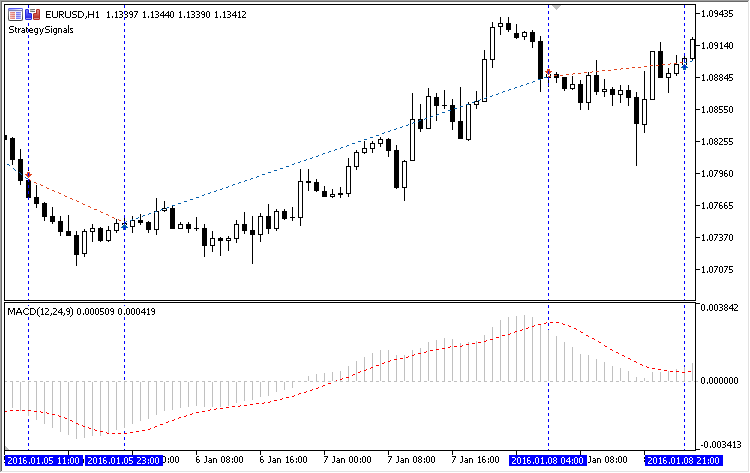 According to the testing mode, trades are opened upon a signal received on the previous bar. The figure shows that on the bar following the crossing of the MACD histogram and the signal line, a long or a short position is opened, and the previous position is closed. We have found out that before you start working with the signal, you need to configure it. Signals are configured using complex signals, which, in turn, also need to be configured before passing them to the signal. Different signals require different objects for operation. For example, some signals only require specification of basic timeseries, while for other signals you need to specify the container of indicators and additional price data, such as the tick or real volume. All this complicates the use of the signals at the user level, since the user needs to know the internal system of the signal, and what data is required for its proper operation. Here are a few more details about index_pattern. Unlike the module signals, it accepts not the pattern mask, but it only receives the index of one of them. Thus, every signal adapter can only use one pattern of the selected signal. The value of index_pattern should be within 1 to 31, and should be equal to the real number of patterns of the used signal. In addition to basic parameters, the structure contains a copy operator, because it uses a string type. That is why it is not possible to automatically copy one structure to another. After determining the necessary parameters and filling the appropriate structure, the user can call the CSignalAdapter::CreateSignal method and receive an instance of the created signal from this method in response. The received instance can be further configured taking into account the specific features of the corresponding signal. Parameters should also be configured for the adapter. However, unlike the first version of the Expert Advisor, all parameters are trivial, i.e. of the basic types. In addition, there is no need to create or monitor other complex objects, such as timeseries and indicators. All this will be done by the adapter. That is why its use greatly simplifies work with signals. Note that after creating the signal, we continued to configure it by setting our own period of the MACD indicator (15, 32, 6). This is easy to do, because the CreateSignal method has returned the corresponding object. 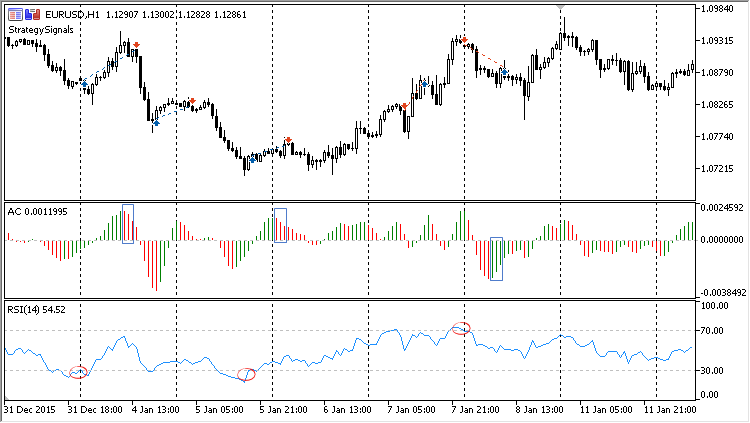 The above logic does the same as the previous example: it opens long and short positions at the intersection of the MACD histogram and its signal line. However, as you can see, the code is even shorter now. Unlike the first version of the signal code, now there is no need to define the direction of the signal each time or to update the values ​​of indicators. Nor you need to add auxiliary objects to the strategy code. All these actions are performed by the adapter. Can we use different patterns and even different signals for market entry and exit? The answer is Yes. We have a full access to the signal system, so we can use more than one pattern. In order to avoid pattern confusion, the signal adapter allows setting only one pattern for use. But the number of such adapters is unlimited. In this case, each pattern is presented by a separate adapter and a signal, even if all patterns are based on one signal. Of course, in terms of resources, it is a slightly less efficient way than the one available in the standard library, but it has its benefits. Let us write an example of a strategy that can receive different entry and exit signals. 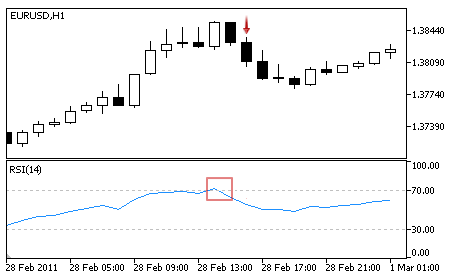 The strategy will use the patterns of the RSI indicator based on the overbought and oversold areas for entries. The second pattern - that of the Accelerator Oscillator (AC) proposed by Bill Williams will be used for exits. Here are the rules of the strategy in more detail. 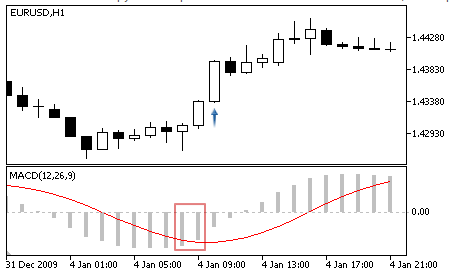 Buying: Reverse behind the level of overselling — the oscillator turns upwards and its value at the analyzed bar is behind the level of overselling (default value is 30). Selling: Reverse behind the level of overbuying — the oscillator turned downwards and its value at the analyzed bar is behind the level of overbuying (default value is 70). Exit from a long position is performed based on the pattern of the AC signal which is used to enter a short position, and vice versa, you exit from a short position using the pattern of the AC signal which is used to enter a long position. Note that the Expert Advisor has an external parameter that allows you to specify the period of RSI. This is performed in the strategy constructor through a direct access to the signal. As can be seen from the chart, the EA uses two indicators — RSI and AC. The EA enters the market when RSI starts rising or falling inside its overbought and oversold areas. These areas are circled in red. The EA exits when the AC indicator forms three lines of the same color. For a buy position exit, the lines must be red and must be above the zero level. For a sell position exit, the lines must be green and must be below the zero level. Such moments are shown in blue boxes. The chart shows that the EA's logic is processed correctly. The trading rules of this Expert Advisor are non-trivial. However, the strategy itself is not long. These are the benefits of code reuse. We have considered a method of integrating the standard library of signals into the CStrategy trading engine. Through this integration, CStrategy is a very handy tool for creating custom strategies based on the patterns of standard signals. 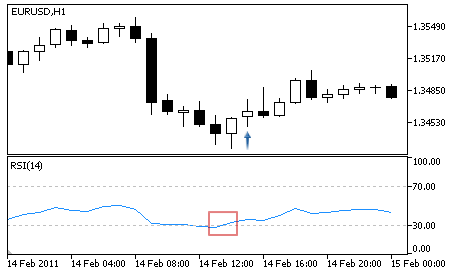 In addition, any signal written for the automated MetaTrader strategy generator automatically becomes available for the CStrategy trading engine. The possibility to use standard trading signals in the CStrategy can significantly save strategy development time. 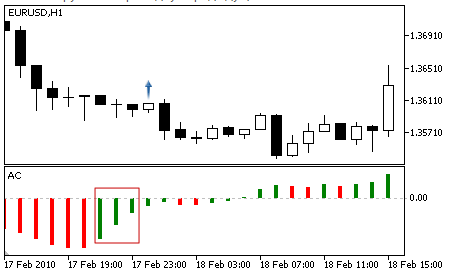 Now you do not need to write your own indicators or pattern detection algorithms, if they are already available in the standard module of signals. In addition, the new feature significantly reduces the complexity of the strategy development process, while the definition of complex patterns, such as the divergence or double divergence, is now performed by ready-made solutions. Hi Amy. I have just completed reading through Vasiliy Sokolov articles. If you are still interested in finding out the solution. Please post the error log here. I recall coming across that error and realised that there is an ".\Panel\Panel.mqh" in declarations in StrategiesList file. Panel.mqh does not exist. Instead, try going to https://www.mql5.com/en/articles/2411 and download the Panel File from there. I believe it has the Panel.mqh file. This series by Vasiliy's is really good as a framework. I learn't a lot too,but when there are issues with a library, if the author does not offer support, you could be left stuck if you are not a good programmer. Which is the point Alain Verleyen made in your other discussions. But those spending time to share their knowledge and skill here are completely amazing. I am eternally grateful. Thanks for all of your articles. The Universal Expert Advisor is really impressive in terms of complexity and Software architecture. Actually, the MacD parameters (15, 32 and 6) are taking no effect here, since CreateSignal() method initializes the MacD signal before the params are updated. Thank you for the great work, and even more for sharing it, Vasily! Sockets… What in our IT world could possibly exist without them? Dating back to 1982, and hardly changed up to the present time, they smoothly work for us every second. This is the foundation of network, the nerve endings of the Matrix we all live in. A regular expression is a special language for handling texts by applying a specified rule, also called a regex or regexp for short. In this article, we are going to show how to handle a trade report with the RegularExpressions library for MQL5, and will also demonstrate the optimization results after using it. How to make the testing process more visual? The answer is simple: you need to use one or more indicators in the Strategy Tester, including a tick indicator, an indicator of balance and equity, an indicator of drawdown and deposit load. This solution will help you visually track the nature of ticks, balance and equity changes, as well as drawdown and deposit load. Before any product is published in the Market, it must undergo compulsory preliminary checks in order to ensure a uniform quality standard. This article considers the most frequent errors made by developers in their technical indicators and trading robots. An also shows how to self-test a product before sending it to the Market.